The aim of our research is to investigate and exploit the potential of radiotherapy with heavy ions and compare this technique to other modern radio therapy technique like proton- radiotherapy or photon based methods like intensity modulated radio therapy (IMRT). From end of 2009 until end of 2014, more than 2500 patients have been treated with ions at the Heidelberg Ion beam Therapy center (HIT). HIT provides a unique possibility to realize all projects within the KFO in one center. Currently ten clinical studies involving ion therapy protocols were initiated, four of which are sponsored by DFG. 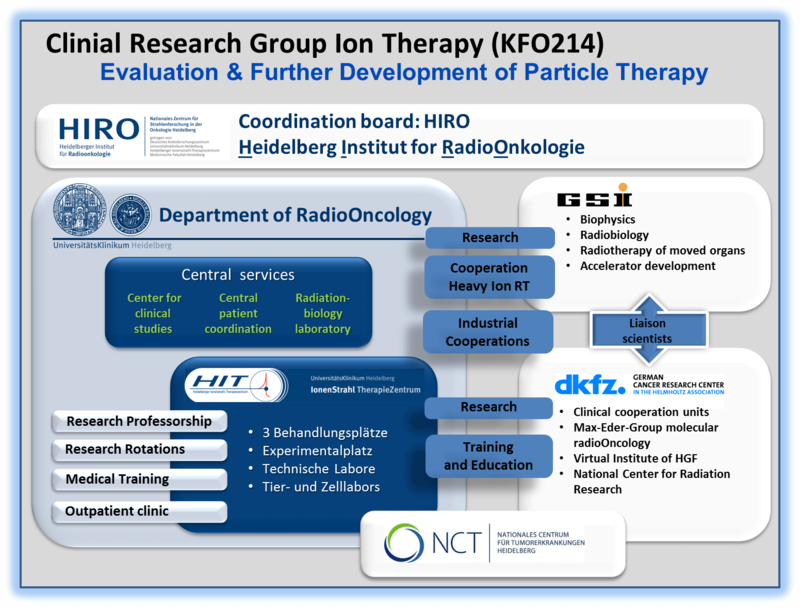 The KFO214 links the University Hospital of Heidelberg, the German Cancer Research Center (DKFZ), the National Center of Tumor diseases (NCT) and the GSI in Darmstadt. The worldwide growing success of proton- and ion beam therapy also raises the demand on well-trained experts in this field. The KFO214 therefore is also very active in theoretical and practical training in medical physics (M.Sc. in Advanced Physical Methods in Radiotherapy), radiooncology and radiobiology ( http://masteronline.ukhd.de). Special emphasis is put on networking and co-operations with international centers which is supported by a central project that manages a multitude of co-operations with academic centers of proton- and ion therapy. In continuation of the DFG-sponsored project started in 2009, further clinical studies will be initiated. 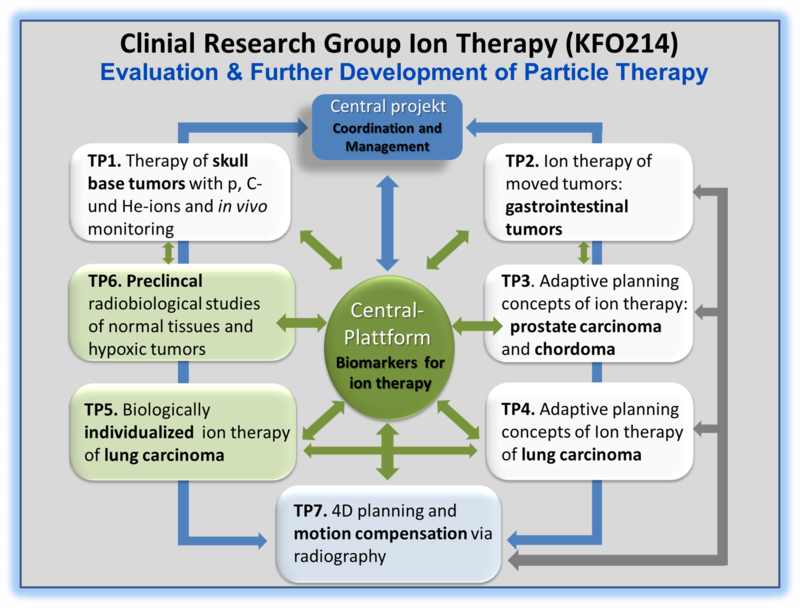 The clinical trials concentrate on optimization of therapies of moving organs with scanned ion beams by adaptive planning techniques. These studies are accompanied by investigations in medical physics and radiobiology. Other topics are positron-emission tomography (PET) for in vivo therapy verification and new imaging techniques (radiography) with ion beams for use in adaptive strategies. In the field of radiobiology, the effect of ion beams on normal tissue and hypoxic tumor tissue is investigated in preclinical settings. Furthermore, methods of molecular radiobiology and biologically individualized therapies are being established for lung carcinoma. There are two central projects (ZP) that interconnect all projects within KFO214. ZP0 coordinates and manages the KFO214 consortium and ZP1 provides methods to identify and optimize specific biomarkers for ion therapy for clinical studies.